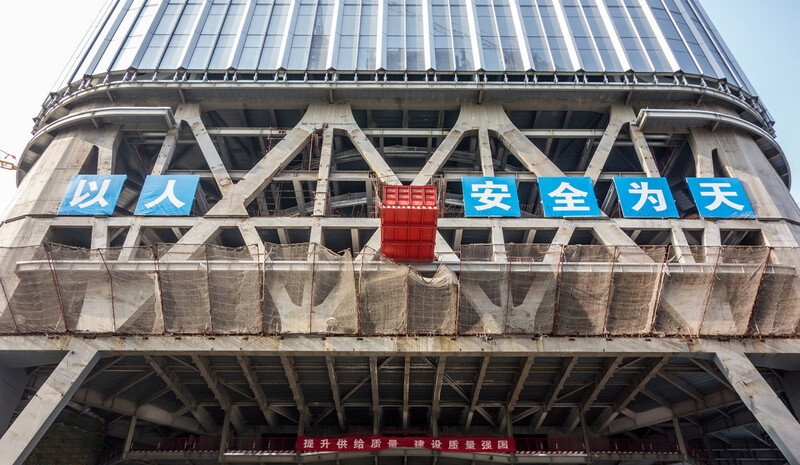 A visit to the tallest construction site in Beijing: the Zun Tower, a 528m high tower in the center of Beijing, designed by KPF and TFP Farrels. One of my work colleagues arranged a visit to the tallest construction site in Beijing: the China Zun Tower, designed by KPF and TFP Farrells . At 528 m height, it will be the tallest building in Beijing, third tallest in China and the fourth tallest in Asia, behind the Shanghai Tower , Shenzhen's Ping An Finance Center (599m), and the Guangzhou CTF Finance Center (530m). 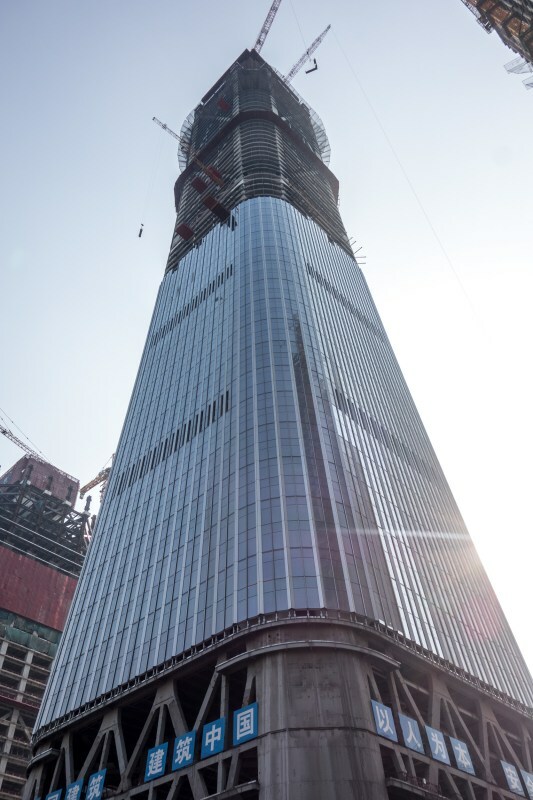 The tower is under construction at the heart of the new Beijing Central Business District (CBD). When finished, the whole area will contain 18 new towers, all interconnected by five underground levels. The China Zun Tower will be the main building and the symbol of the entire development, standing at the north end of its central axis, which will be a mix of public park and underground shopping. At the time of my visit, the construction was already standing 395 m high (at the date of this writing it had already reached 451 m). The building site is impressive. It is small, for such a large building, since all its surrounding plots are also under construction. It is already surrounded on both east and west sides by five other towers in advanced construction stages. The south plot was still a huge, 25 m deep hole in the ground. The magnitude of it all was breathtaking. It took us two elevator rides to reach the last built slab. The structure was what impressed me the most. It is the only tower of this height in the world to be constructed in an earthquake zone of magnitude 8, which makes the structure not only massive but also abundant. At the transfer floor, midway up the tower, the usable area was quite minimal. This floor was, however, at the thinnest section of the tower, its “waist.” The shape of the tower, inspired by ancient Chinese wine vessels, is quite peculiar as it funnels back out towards the top. Which is even more mind-blowing: a super tall tower, in an earthquake zone of magnitude 8, which has a thinner midsection that opens up to a larger top section? I wouldn’t believe possible unless I could see it happening. And I do, every day, from our office window. At the top, the cranes were working at full speed, lifting structural members and facade panels. The view was fantastic, and we could spot most of Beijing’s modern architectural icons. OMA’s CCTV complex stood right underneath us, and it could see how its quirky design fits perfectly to its landscaped gardens and neighboring buildings. SOM’s WTC Towers stood tall right across the 3rd Ring Road, the oldest once the tallest building in the city, the newest nearly finished standing at 280 m high. Further west, barely distinguishable, the lumps of Zaha Hadid’s Galaxy SOHO marked the position of the 2nd Ring Road. Guomao’s large traffic intersection spread to our south, right across from Yamamoto’s beautiful Jianwai SOHO's rotated white towers. 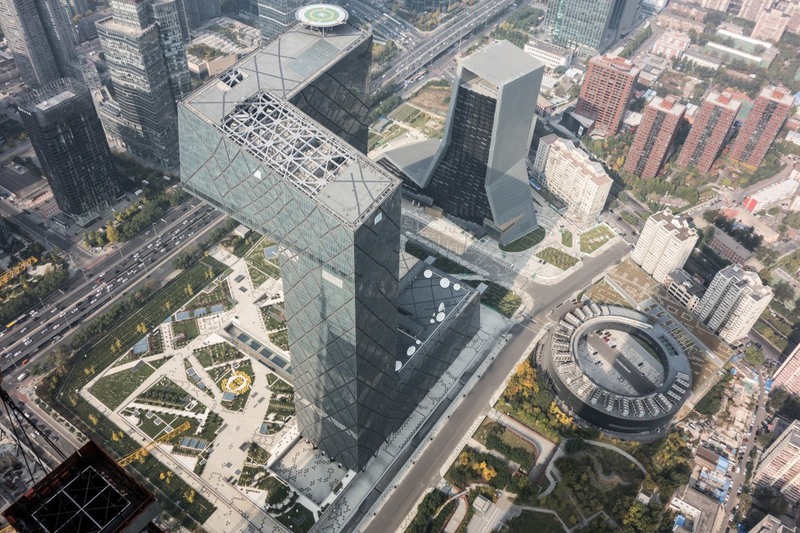 Up north, the distinctive black mass of MAD’s Chaoyang Park building stood out among its neighbors and, further north, Zaha Hadid’s beautiful Wangjing SOHO hills dominated the skyline. It will certainly be a new icon to Beijing, redefining its skyline and standing visible from any point in the city. The future observatory at 500 m height will certainly become one of the city’s main touristic attraction, and certainly, one that I will visit several times. But it will never take, in my opinion, CCTVs place as the symbol of Beijing’s (and China’s) architectural revolution.